Natuzzi Sensor power reclining corner sofa. 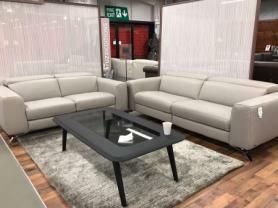 Upholstered in family friendly grey Italian leather. Features power recliners and power headrests on both ends operated by concealed heat sensitive buttons and a manual ratchet headrest on the extra seat. This modular sofa can be configured with the long side on either the left or right hand side. The last one available, put on display to photograph at a bargain price. Approximate Measurements: 314 cm. x 232 cm x 105 cm deep.